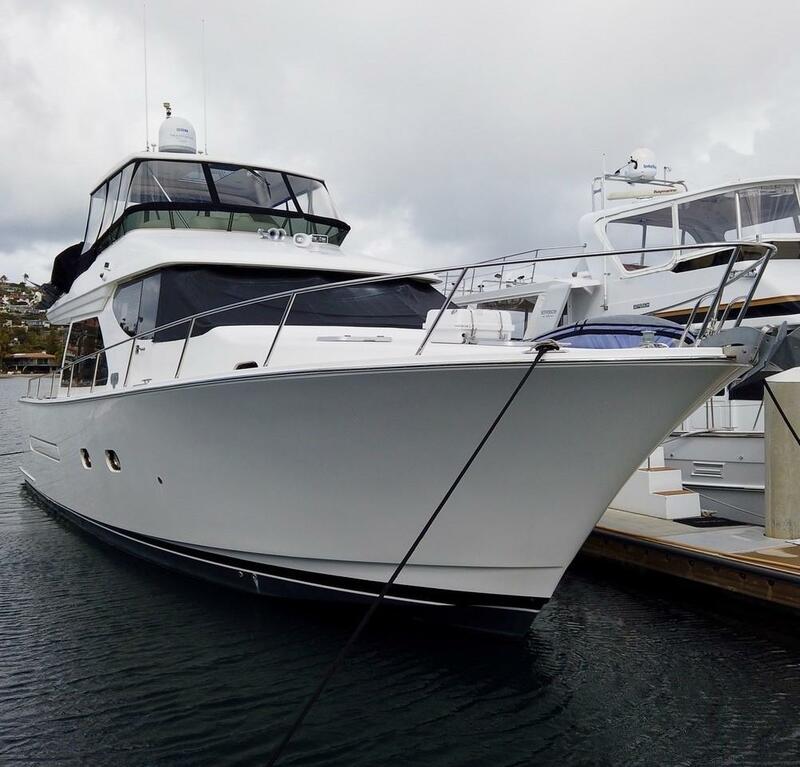 This is a stunning 2009 West Bay 54 SonShip, built at the legendary Pacific Northwest West Bay shipyard. 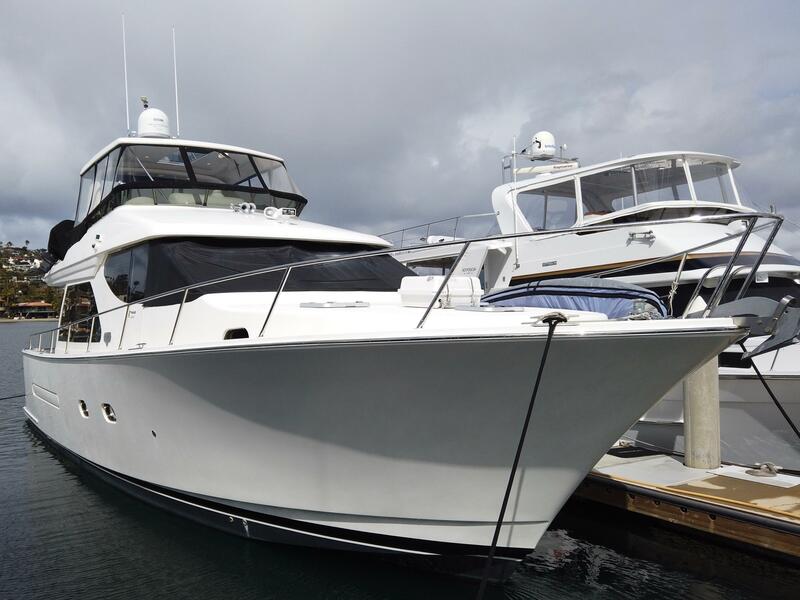 This SonShip hull # 54-07 comes complete with an unbeatable package of custom factory options, extensive owner upgrades; and delivers grace, beauty and superior built systems and performance in a conveniently sized motor yacht. 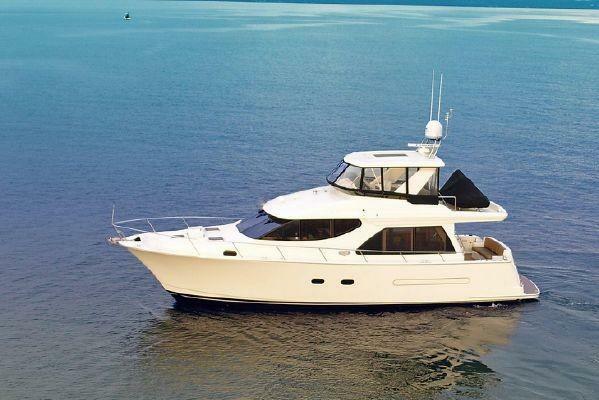 For those looking to own a manageable yacht without sacrificing quality of build and materials, look no further than the SonShip 54. 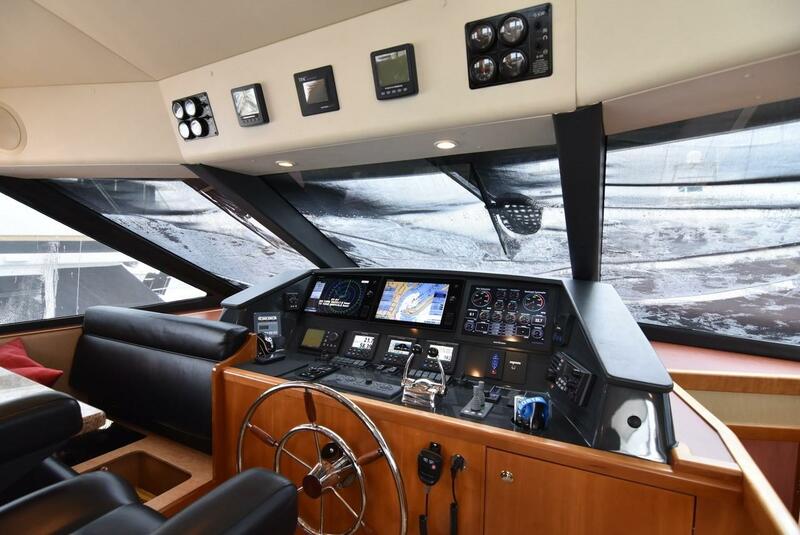 Volvo D12D-B 715 HP engines with Volvo controls at Pilothouse and Command Bridge and power steering. Teprorib matting package in Lazarette and Transom storage locker. 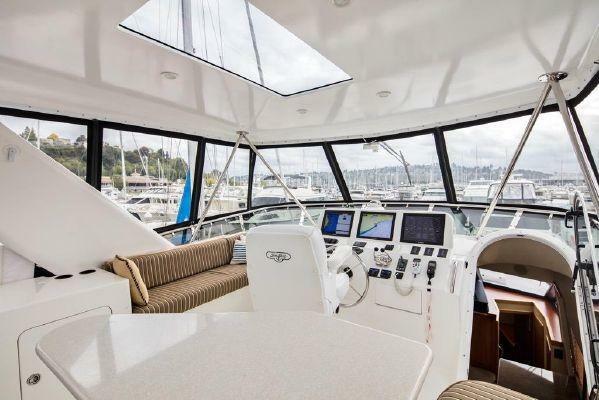 50amp Glendinning system with 75 ft. power cord at transom. One (1) Miele 240 volt AC barbecue to port forward cabinet. Raw water washdown tap at anchor locker. Interior décor package #3 (Black / Tan. 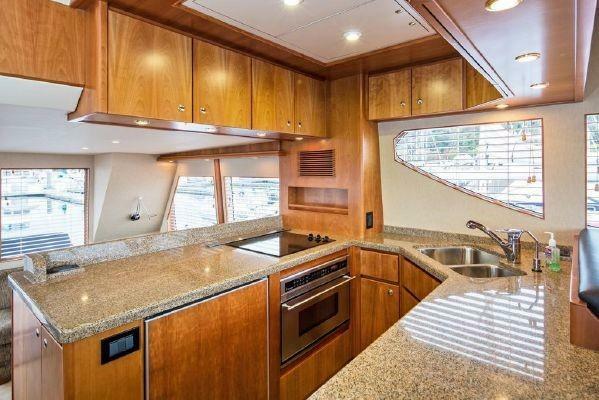 Granite countertops in Galley and Phantom screens for Salon doors and Pilothouse door. 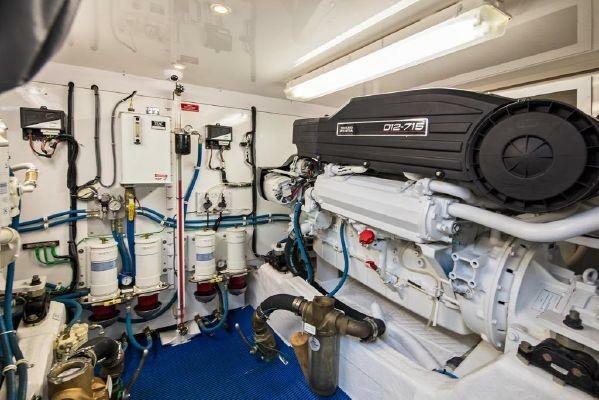 Espar model D5-L forced air heating system, (2) vari-speed furnaces with outlets throughout vessel. Custom salon chair. 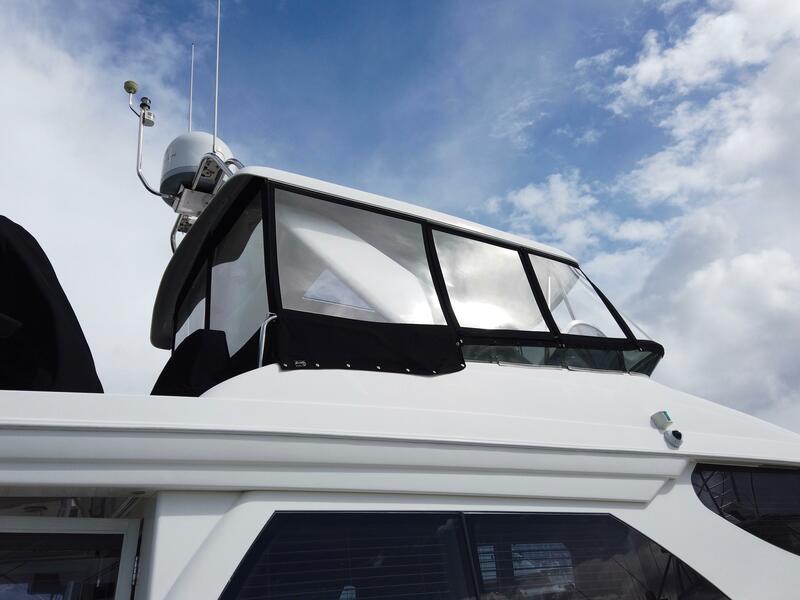 Stainless steel elliptical port lights (2) with screens and privacy covers, (1) port and (1) starboard. 17" LCD TV/DVD combo on forward wall to port in Master Stateroom. 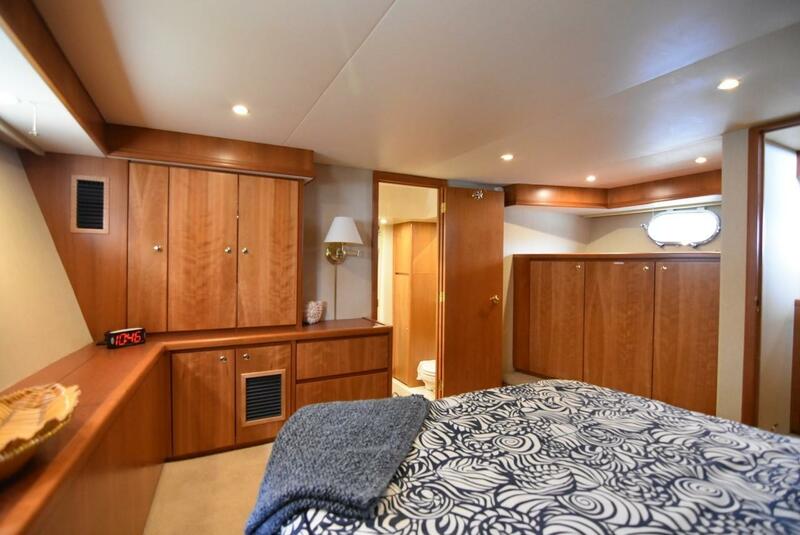 Washer/dryer combo unit located in cabinet above forward port dresser in Master Stateroom. 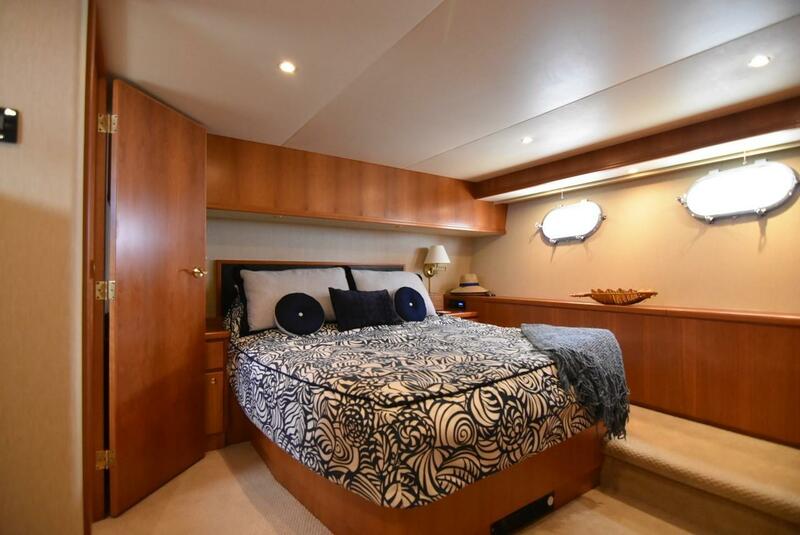 * Two staterooms, two ensuite head layout with additional sleeping space on salon sofa pullout. 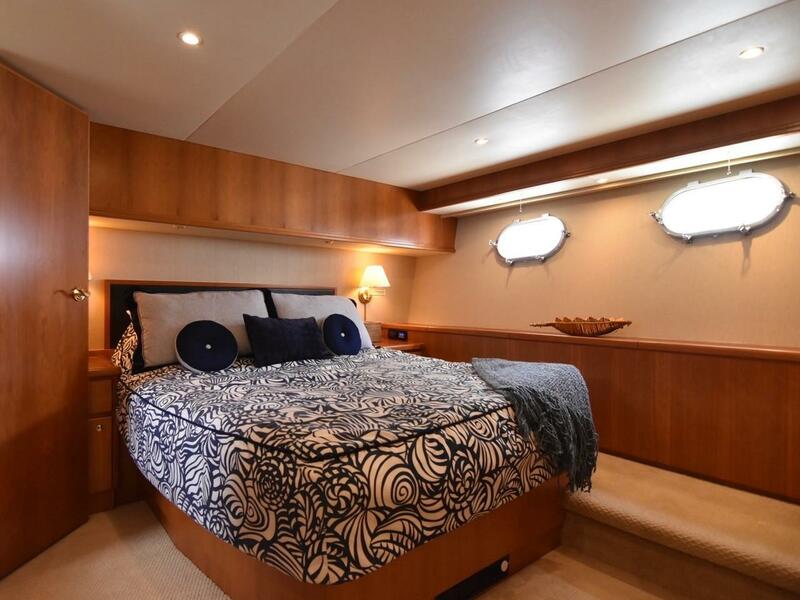 Two separate sets of staircases leading to each secluded ensuite to ensure complete private access to the nearly equal sized staterooms. 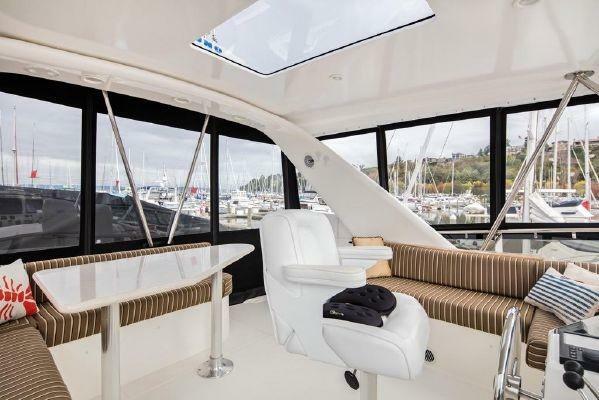 * The only yacht in its class with a stand-up engine room, the West Bay SonShip 54 engine room was designed with ease of access in mind. 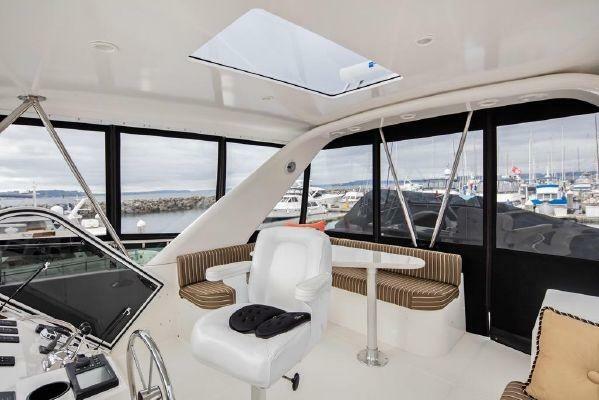 A floating ceiling and forward bulkhead are fitted with ample sound-proofing which effectively prevents engine noise from transferring into the living areas, so you can carry on a conversation while underway without having to raise your voice. 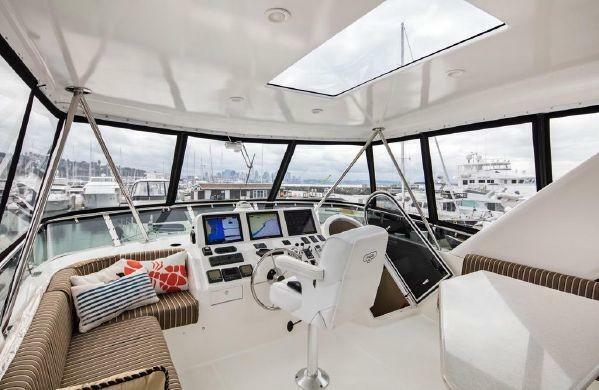 * Walk-around side decks with raised bulwarks permit safe and easy movement about the vessels exterior. * A 3ft 10inch draft permits comfortable manoeuvring in shallow areas, while propeller tunnels and a substantial keel provide further protection for the propellers. 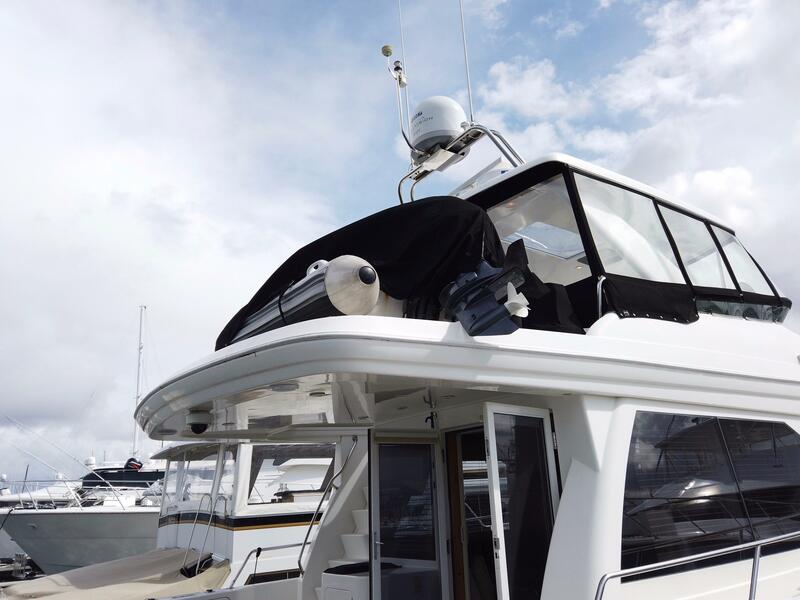 * Transom storage, easily accessed from the swim grid, and a large lazarette area beneath the aft deck, provide convenient spaces for stowing fenders, life jackets and plenty of other gear. 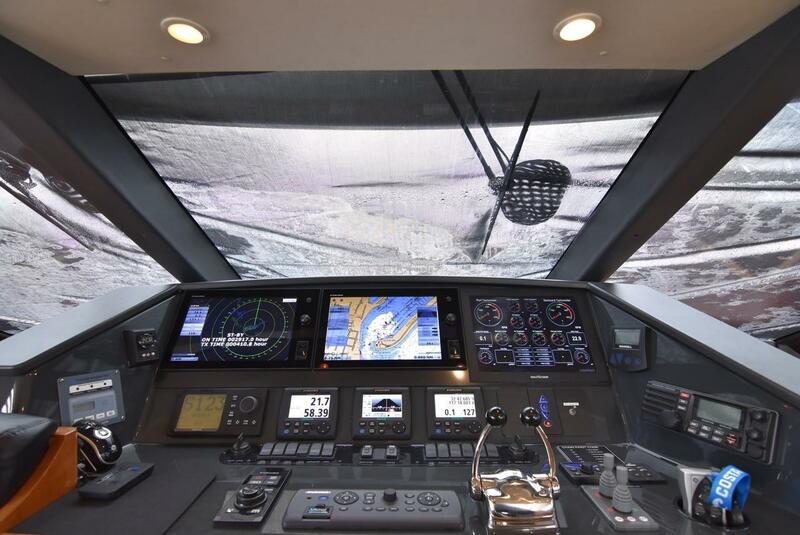 * Molded stairs leading from the aft deck to the command bridge provide safe and easy access to the bridge deck. 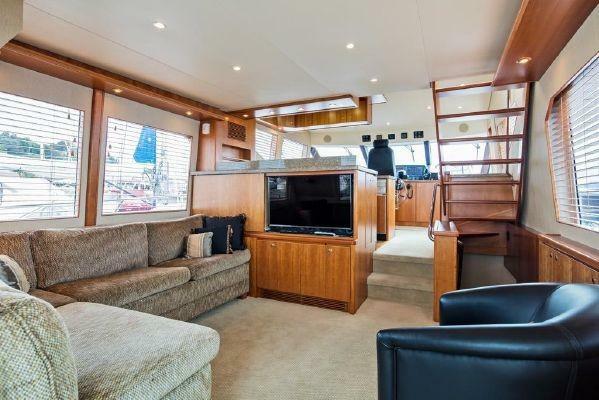 * The open layout on the main deck permits excellent visibility and allows for owners and guests to gather together in a comfortable area. 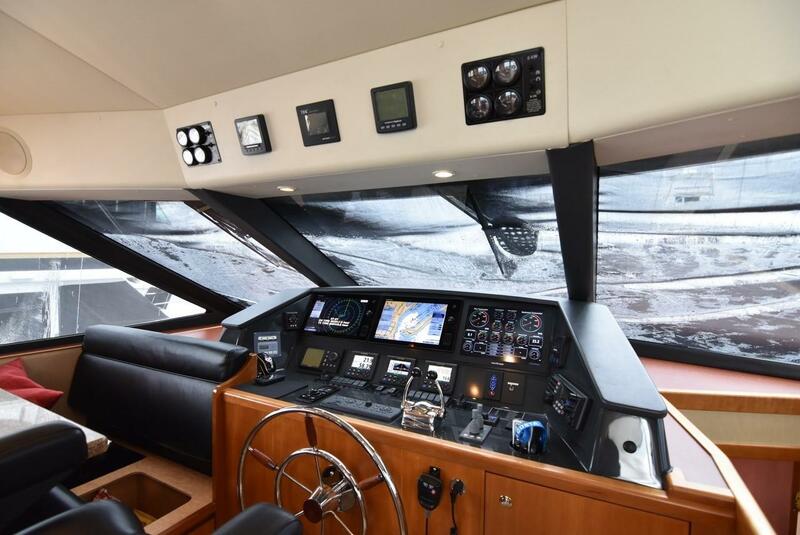 * Climate control with Espar forced air heating system and Cruisair air conditioning system for Galley and Pilothouse. 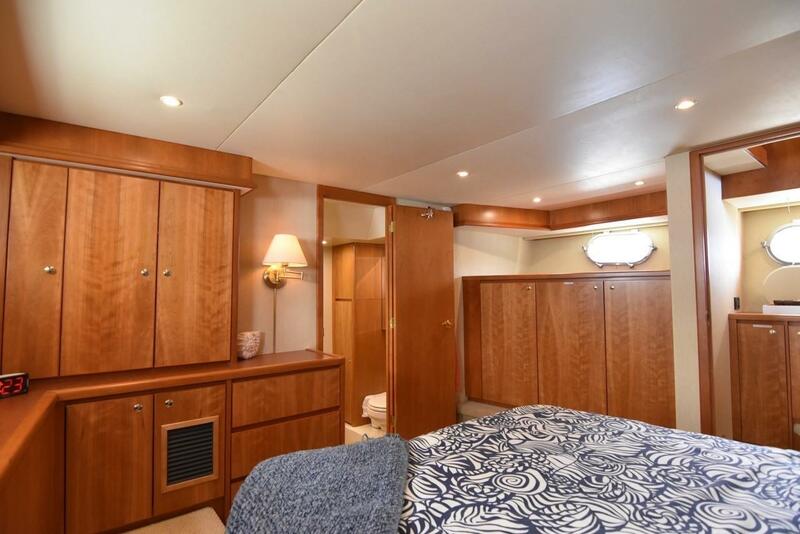 * Two additional portholes in the VIP stateroom for comfortable, natural lighting. 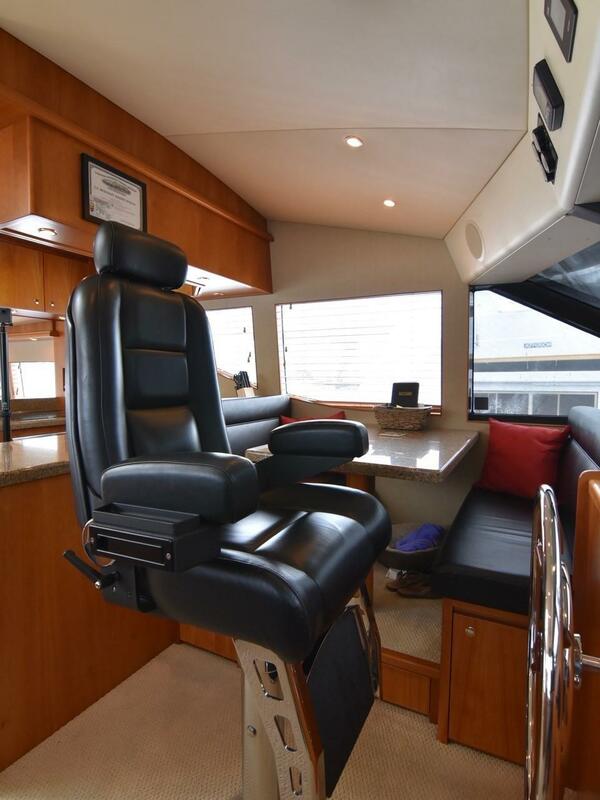 * Custom command bridge layout featuring West Bay styled helm seat, L-shaped settee and triangular table. 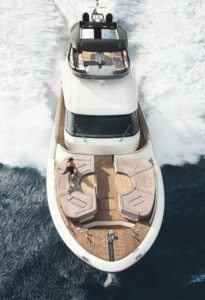 * Twin Volvo 715HP engines deliver an estimated top speed of 24 Knots and a 21 Knot cruise. 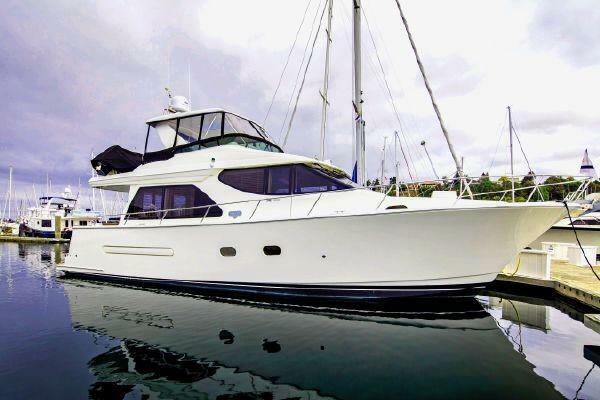 Builder: West Bay SonShip Yacht Builders Ltd. 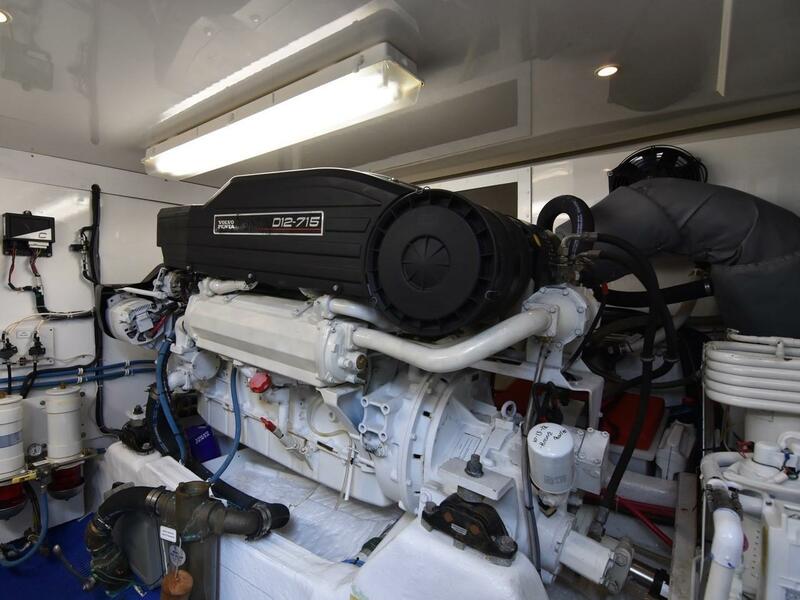 Designer: West Bay SonShip Yacht Builders Ltd.
Standard Volvo D9-500 500 hp diesel inboard engines upgraded to D12D-B715 715hp diesel engines (FWC) with marine gears, adjustable engine mounts, Quiet Run underwater exhaust system and low RPM back pressure compensation system. Volvo controls for throttle and clutch functions. Two 4-blade high-speed computer designed manganese bronze propellers. 2.25 inch propeller shafts (Aquamet 22HS). Hydrodynamic stainless steel V-struts with replaceable Cutlass bearings. Hydrodynamic manganese bronze rudders and hydraulic steering assembly. Two Delta T 24 volt engine room blowers on thermostat. Four 24 volt Rule 2000 bilge pumps, one in each major compartment. (2) Fire extinguishing system: Fireboy. Fuel level indication: sight gauge on tank. Fuel tank: aluminum, marine grade. Generator 1: Northern Lights 12 kW with sound shield, muffler, remote panel and Silent Run exhaust system. 846 Hours. 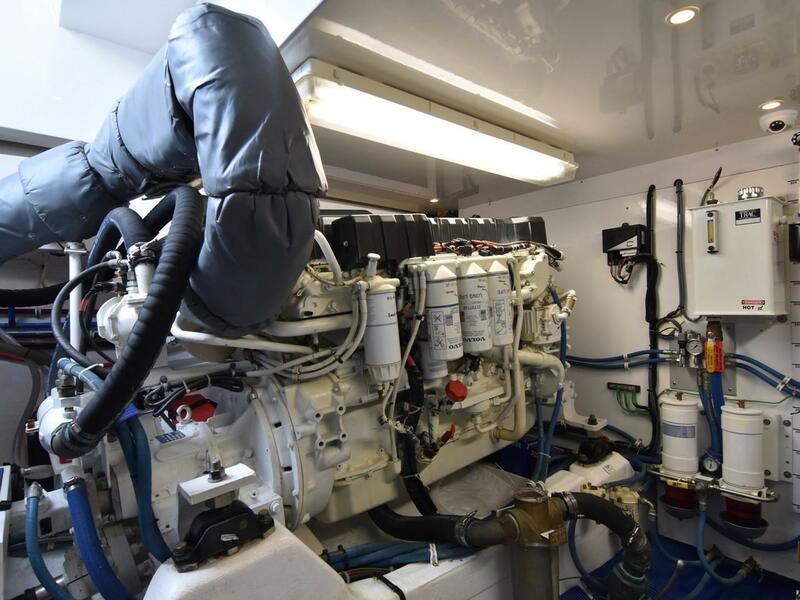 Generator 2: Northern Lights 6kW with sound shield, muffler, remote panel and Silent Run exhaust system. 418 Hours. Bronze and / or Marelon ball valves on all intake and exit thru-hulls below the waterline. 24 volt xenon overhead lighting. 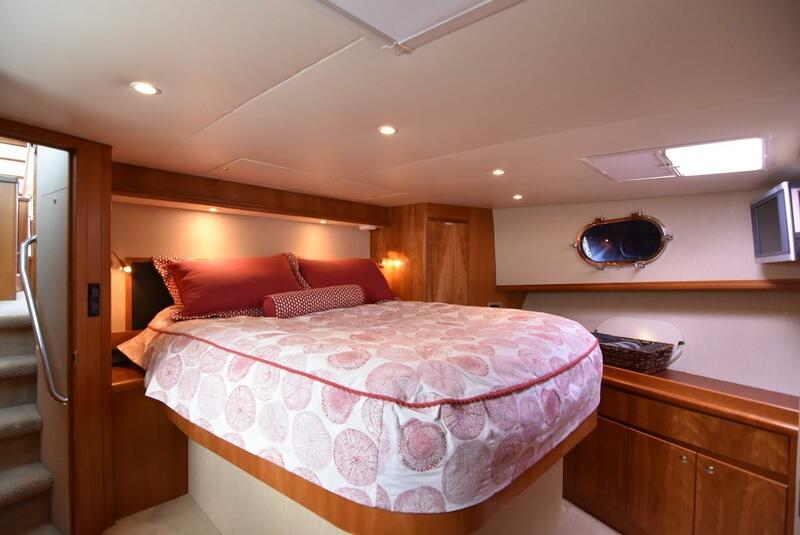 Incandescent lighting in Lazarette & Forward bilges and 120 volt fluorescent lighting in Engine Room. 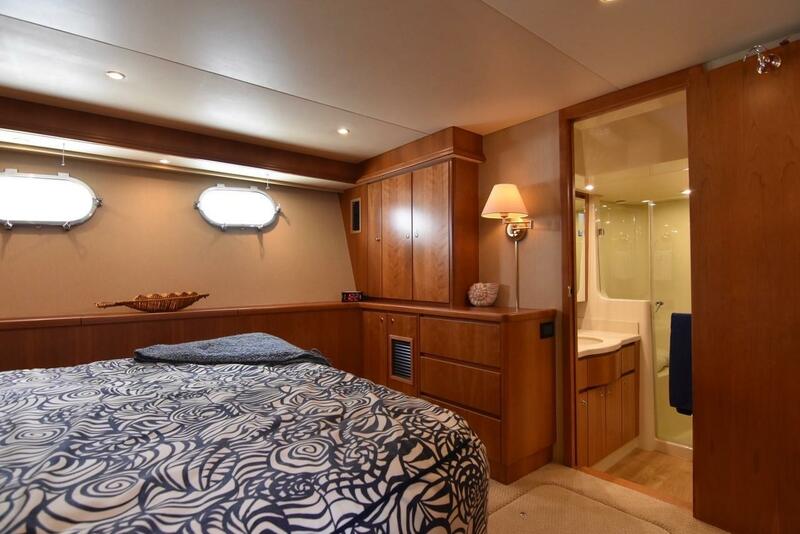 Sound insulation: barium filled foam composite laminate in Engine Room bulkheads and overhead. Groco Sea strainers for main engines and generator: large capacity, easily accessible for servicing. Shower sump with automatic pump system and strainer. Fresh water system: (1) 24 volt pump with pressure sensing and accumulator tank. Tankwatch monitor. Hot water tank: 30 USG (AC 240 volt) with heat exchanger. Potable water tank: polyethylene. Tides Marine Strong main engine and rudder shaft seals. Flooring with blue Teprorib matting in Engine Room. 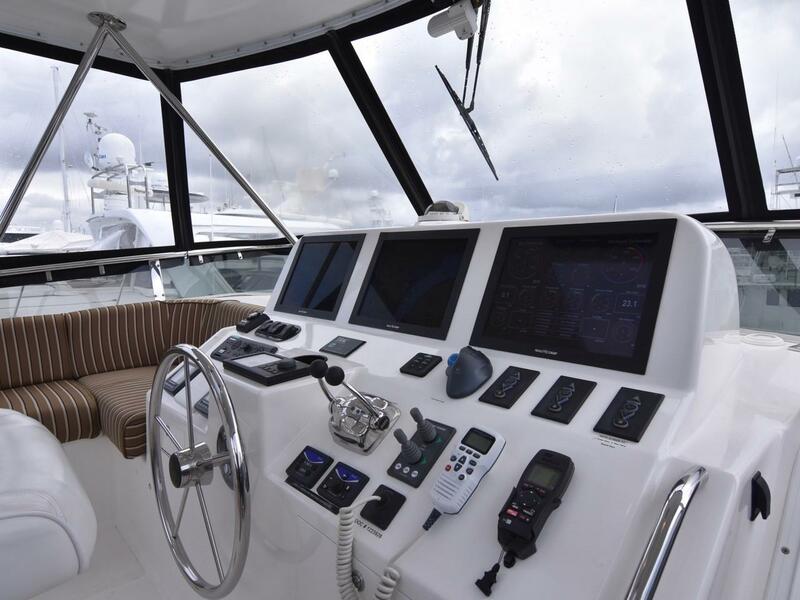 Lenco Trim tabs with controls at Pilothouse and Command Bridge. Bow thruster (24 volt electric): 10" dual prop. Audio, temperature and oil pressure alarm systems (Volvo ). 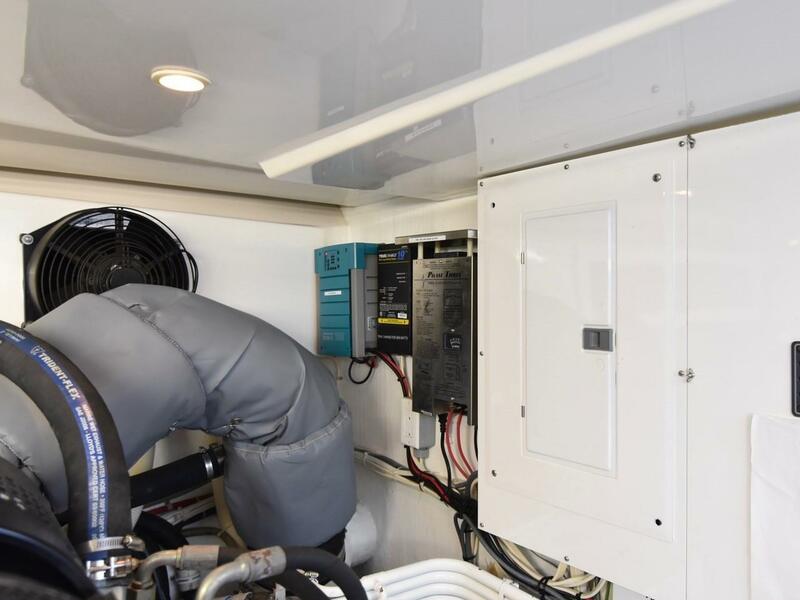 Ships battery / inverter set: 24 volt, 525AH Optima sealed deep cycle AGM, and updated Magnum 3000-watt inverter. Starting battery set: 1400CCA 24 volt for main engines (2 - 8D sealed type). Engine control battery set: dedicated 24 volt set for Volvo engine controls (2 - H31-DCM sealed type). Thruster / Windlass booster battery set located forward, 24 volt, connected to ships battery set (sealed deep cycle). 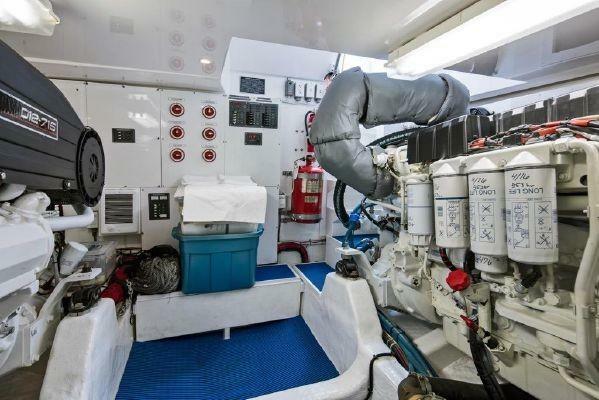 100 amp 24 volt alternator to charge ships battery set, starboard engine. 60 amp 24 volt alternator to charge engine start and control battery sets, port engine. 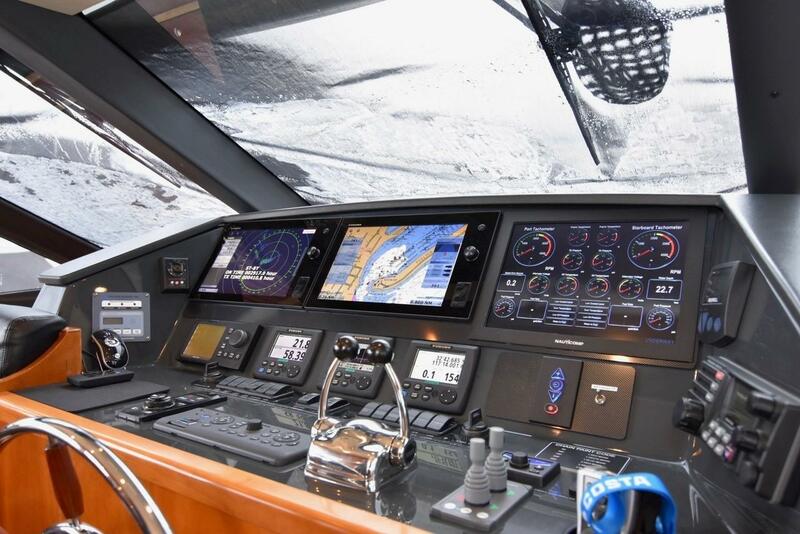 Custom Yacht-O-Matic to provide hands on control for generator, shore power and inverter. 60 amp charger, 24 volt to ships battery set (part of the 3000 watt Outback Inverter). Xantrex TrueCharge generator battery charger. AC circuit breaker panels for inverter loads and non-inverter loads. AC digital meters for voltage, amperage. 24 volt DC panel with digital multi-meter for voltage and house system load amperes. 12 volt DC panel with digital multi-meter for 12 volt accessories. 24 volt DC to 12 volt DC converter for 12 volt equipment supply. 24 volt DC xenon and 24 volt DC stair lights. 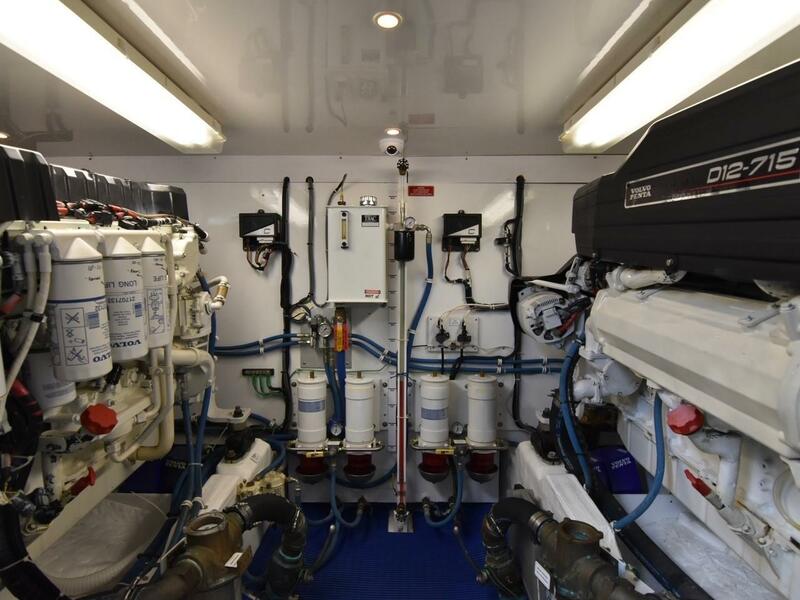 GFCI receptacles in all Heads, Engine Room, Aft Deck, Command Bridge, Galley, Lazarette and Transom storage. 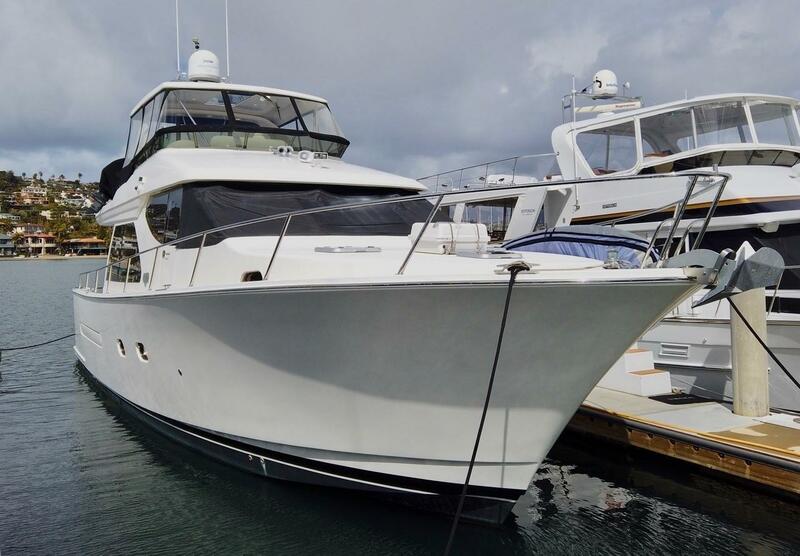 24 volt navigation lights and anchor light. 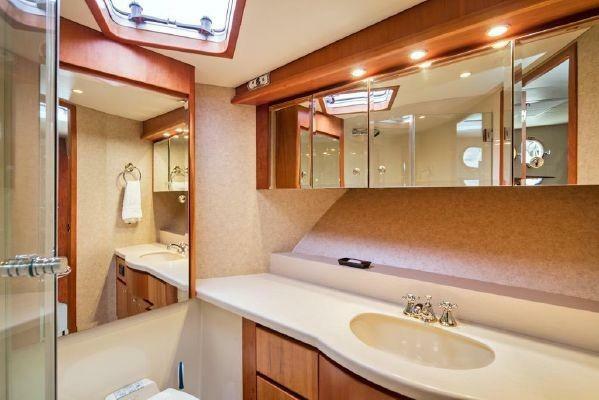 Dockside telephone/television receptacle at Transom with outlets in Salon, Master and Forward Guest Stateroom. 50 amp, 120/240 volt shore power Cablemaster with 75' of cord with isolation transformer at Transom. Bonding system, including sacrificial anodes and shaft brushes. 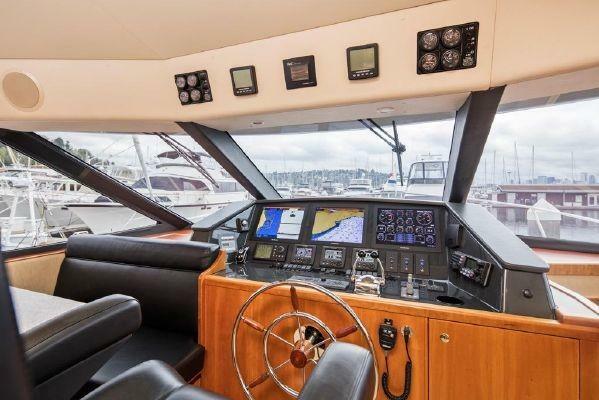 Separate 24 volt electronics circuit breaker panel in Pilothouse. Commercial grade ANL fuses on all heavy DC battery systems. 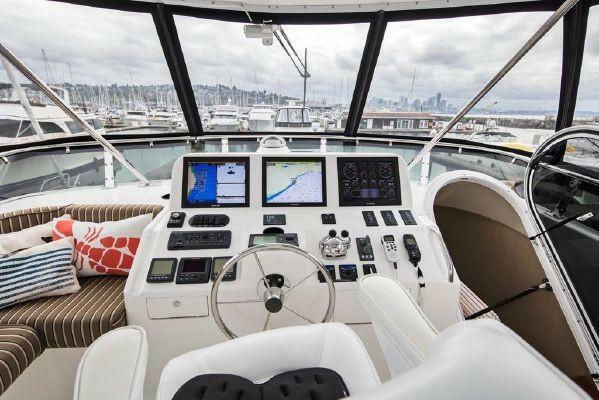 Automatic 120-208-240 volt AC shore power selector to allow use of various available dock powers, digital voltmeter to show dockside voltage. 1.25 inch 316 stainless steel handrails and rail fittings. Electric anchor windlass with hand held control at bow and with controls at bridge and Pilothouse, Muir 24 volt DC. Anchor: Davis Talon XT-60 (60 lb.) galvanized. Upgraded 300ft 5/16 galvanized chain with paint code every 50'. Teak flagstaff (aft) and stainless steel burgee staff (forward). Mooring cleats: (10) including (2) bow, (2) stern, (4) springline and (2) flip-up on Swim Grid. Mooring lines: (4) including 2-35ft and 2-25ft x 5/8 black. Fenders: (4) 10inch x 2inch, black with 15ft x 3/8inch lines. Stainless steel and chromed brass hardware. Dockside fresh water connection with pressure regulator at Transom. 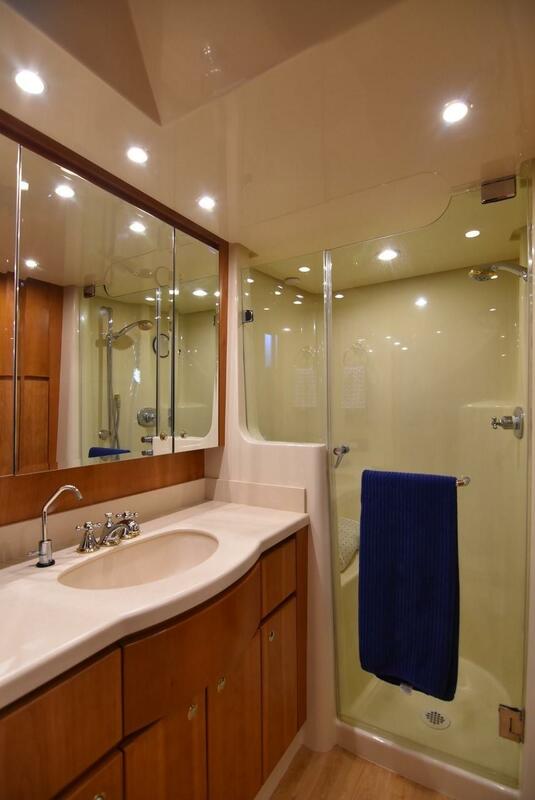 Fresh water washdown taps at anchor locker, starboard Aft Deck cabinet and Command Bridge. 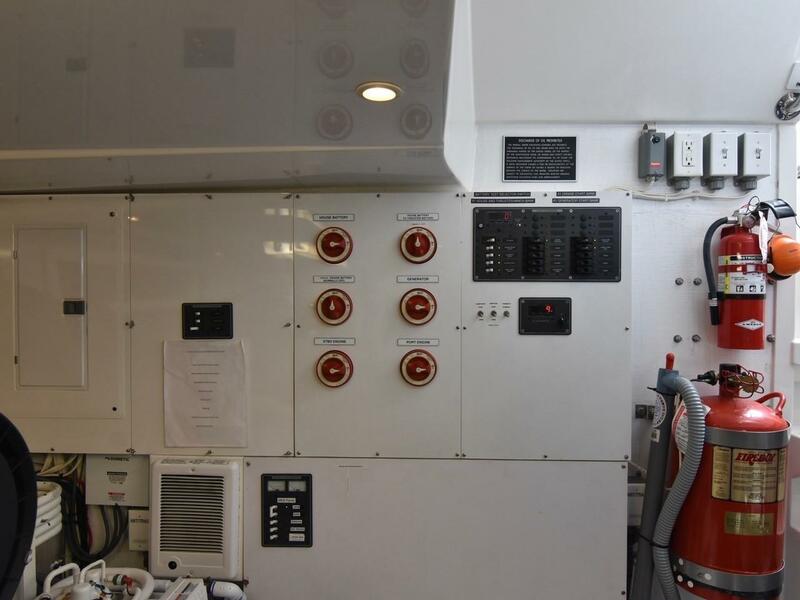 Port and starboard fuel deck fills, midship. Lounge seating aft, molded, with Sunbrella cushions and Stamoid weather cover. Molded stairs to aft bridge deck, port, with double sliding hatch. Aquatik Hand-held shower at transom. 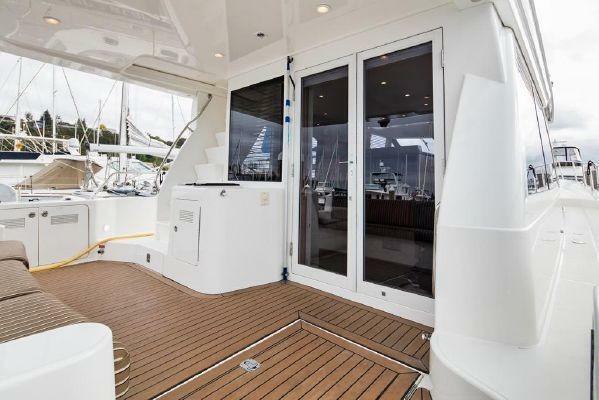 Transom gates port and starboard, hinged,with stairs from Aft Deck to Swim Grid Swim Grid with ladder. Speakers (2) and waterproof volume control, connected to Salon stereo. Transom storage locker with (2) doors. Stern rode on a reel for securing transom to shore. West Bay style helm chair. 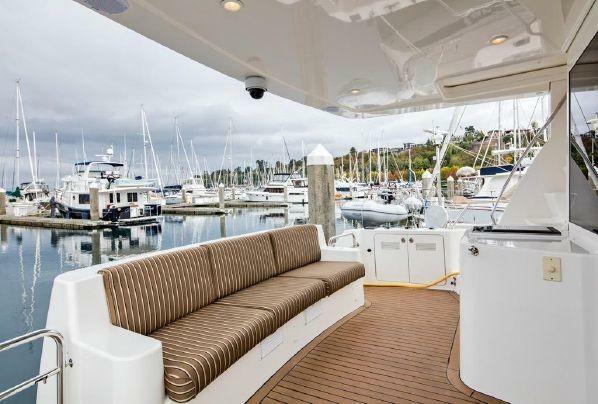 L- shaped molded bench seating, port and starboard with Sunbrella cushions (2). Solid surface table with (2) aluminum pedestals. Hatch from bridge to Pilothouse & hatch from bridge to cockpit. 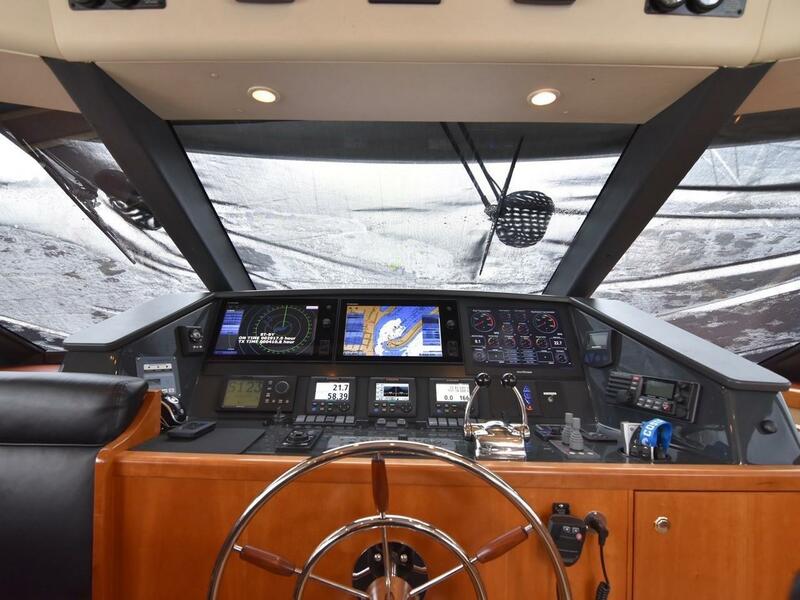 Dash, molded, with hydraulic steering, stainless steel Destroyer type helm wheel, start/stop controls for main engines, Volvo engine controls and display panels, controls for bow thruster, trim tabs and windlass, switches for navigation lights, horn, and flush-mounted 3" magnetic compass. Tinted plexiglass venturi. Volume control with (2) Alpine waterproof speakers connected to the salon stereo. Lifeline with stainless steel stanchions surrounding bridge deck, aft. Select flat cut American Cherry woodwork. 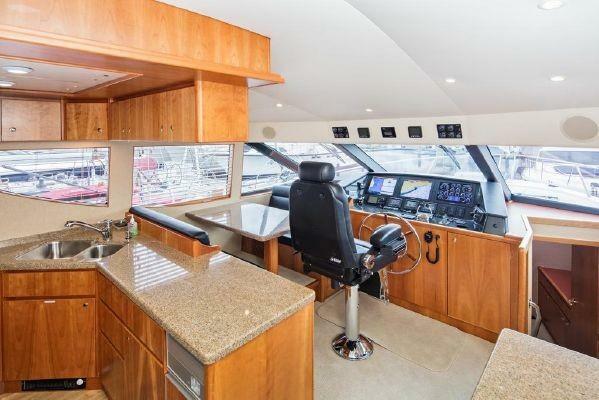 Laminate vinyl flooring, Galley and Heads. Lighting: flush-mounted xenon in ceiling with Vimar switching. Custom sconces and reading lamps throughout. Aromatic cedar lined closets and hanging lockers. 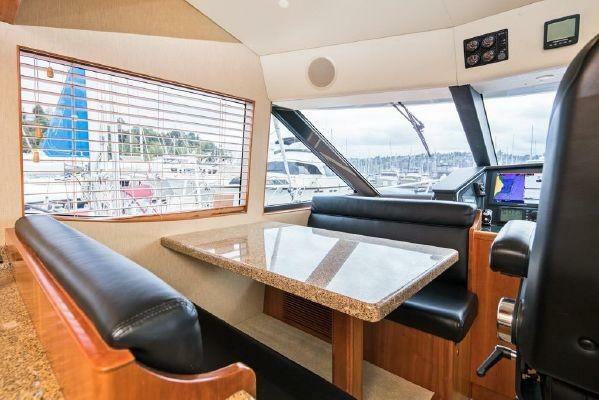 Solid surface countertops: Galley, Pilothouse settee table and head. 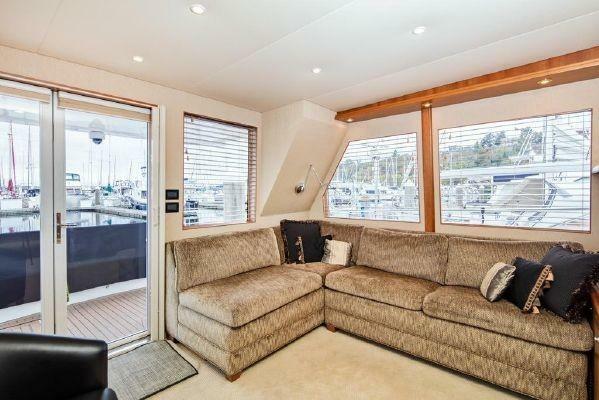 Built-in sofa with pull-out sleeper. Storage cabinet (1) above entertainment center. 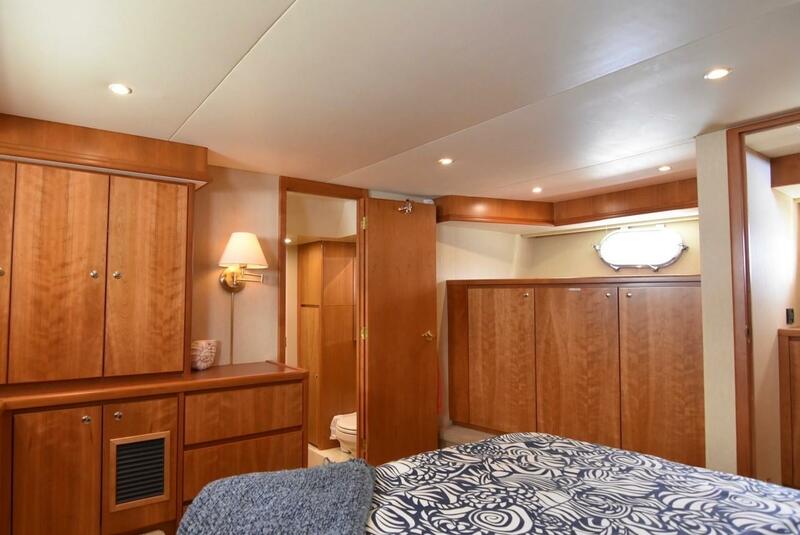 Cherry wood Blinds: port, starboard and aft. Xenon lighting with Vimar switching. 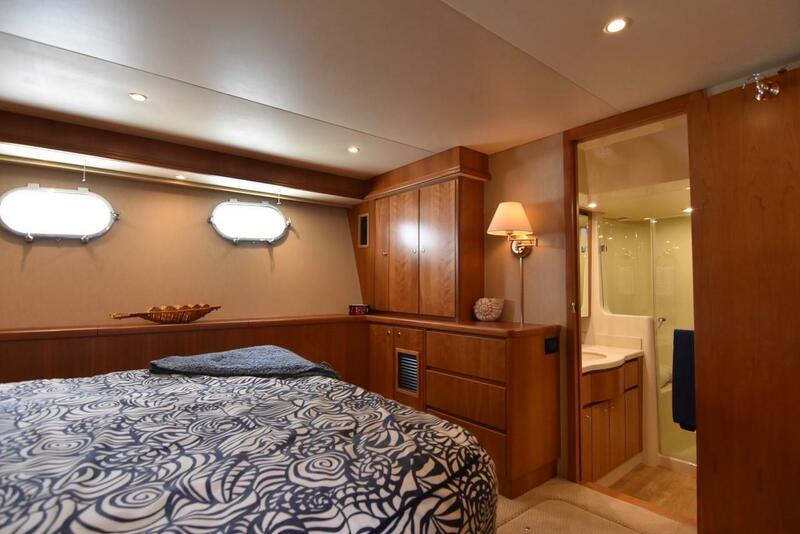 Salon doors with painted aluminum frame and lock, at aft bulkhead. Cabinet for electrical breaker panel and power status indicators, with light and door at forward stairs, inboard. 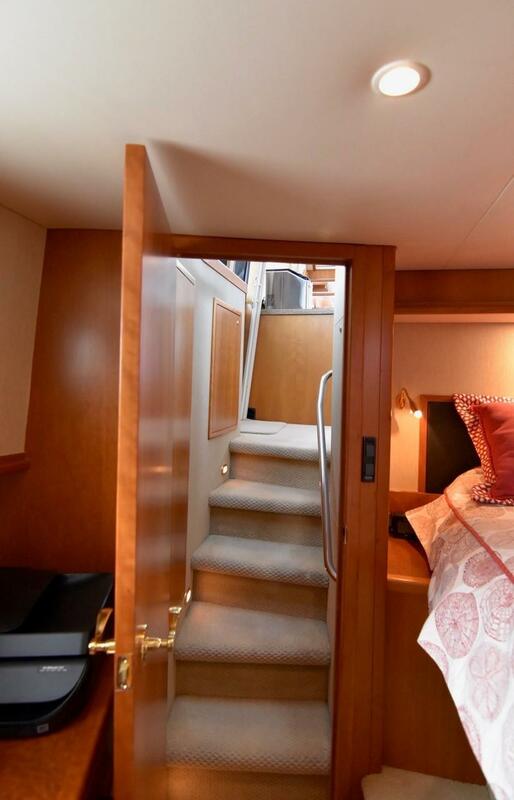 Stairs, starboard to Master Stateroom with wallcovering on walls. 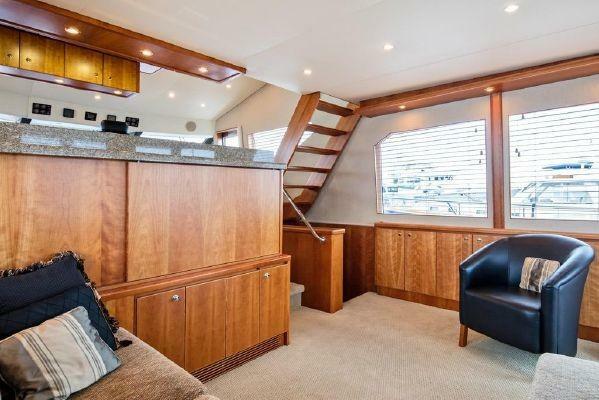 Stairs, starboard from Salon to Galley with stainless steel grabrail, outboard. Freezer: Sub-Zero in starboard cabinet. Wood veneer fronts on fridge and freezer. Cooktop: 3 burner deluxe with pop-up ventilator fan. Stainless steel double basin sink, undermounted, with faucet (Grohe). 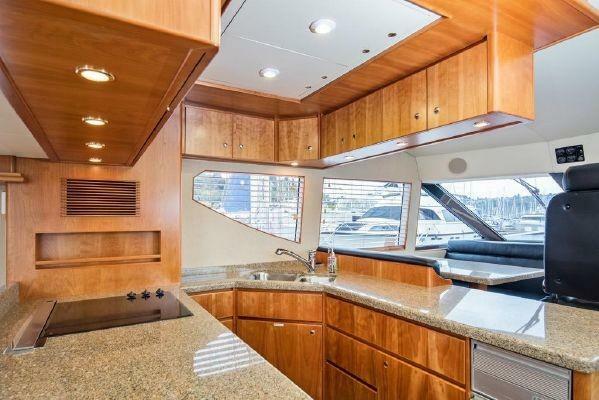 Built-in spice rack, aft port. Solid surface countertops with splash rail aft. Cabinets over cooktop and forward counter. Stairs, starboard to Forward Guest Stateroom. 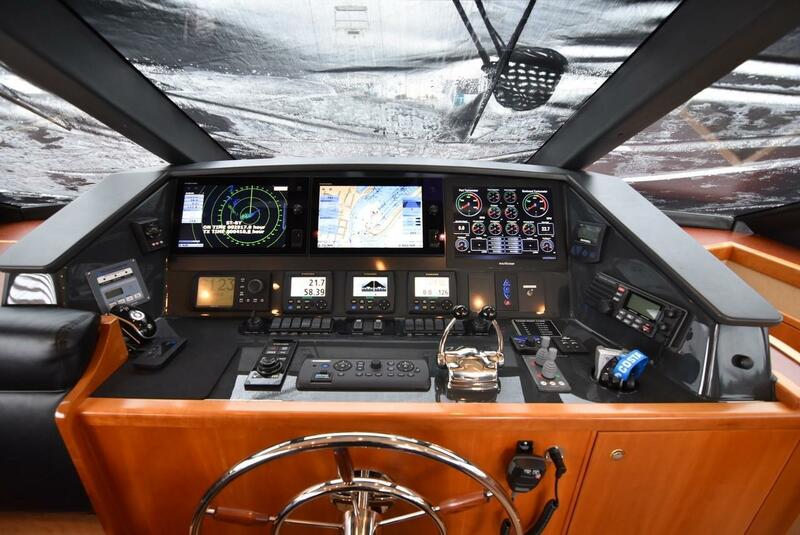 Helm with stainless steel Destroyer type helm wheel with wood accents, start/stop controls for main engines, Volvo engine controls and display panels, controls for bow thruster, trim tabs and windlass, generator control panels, switches for navigation lights, instrument lights, anchor light, horn, bilge pumps, wipers, defogger, display panel for fire extinguishing system, and digital compass. Three marine grade windshield wipers with two speeds, wash and park. Windshield ambient air defogger fan, 24 volt. Dinette and settee with Solid surface tabletop on raised platform with storage in platform. 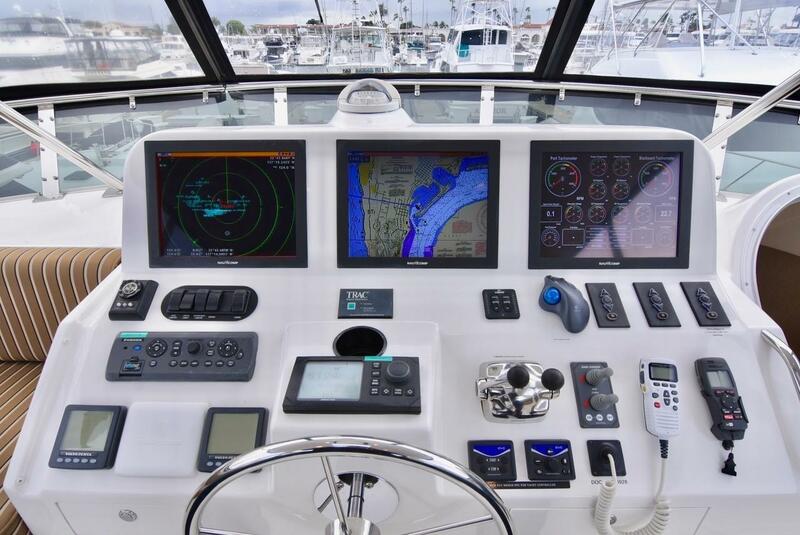 Chart storage, port of dash. Starboard flush-fit aircraft type sliding door with pop-open window and lock. Stairs to Command Bridge, wood with non-skid on treads. Stainless steel grab rail on starboard side of stairs to Command Bridge. Holding tank monitoring system display panel (Tankwatch). Valance above portlights w/ blinds. Hanging locker with light, starboard. Storage cabinet forward of hanging locker, starboard. Bin storage, port hull side. Reading lights with switch at fixture. Stainless steel oval portlights with screens. Queen-size bed, 7inch reversible foam mattress, bedspread and pillow shams (2). Hinged bed frame with tremendous storage below. Master Head Solid surface countertop with oval sink, undermounted, with faucet (Grohe). Mirrored medicine cabinet doors over sink. Storage cupboard and drawers in sink cabinet. 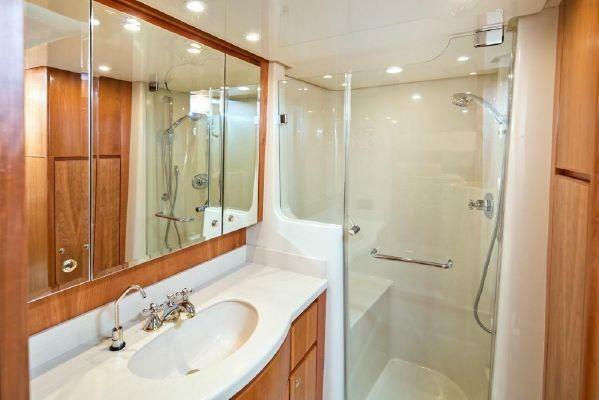 Shower stall with frameless glass door and cross handle polished brass showerhead (Grohe). Polished brass paper holder, towel ring and robe hook. Ventilating fan on switch Fitted headliner. 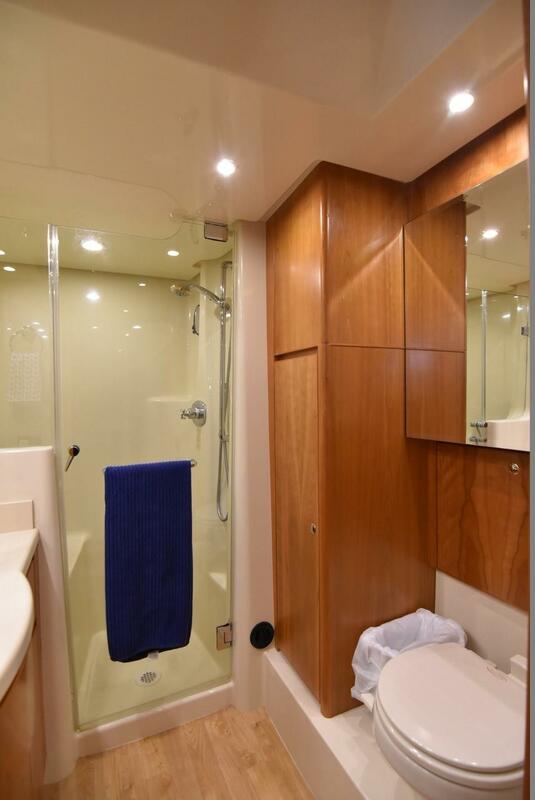 Linen locker, forward port of shower. Hanging locker with light and storage shelf, port aft. 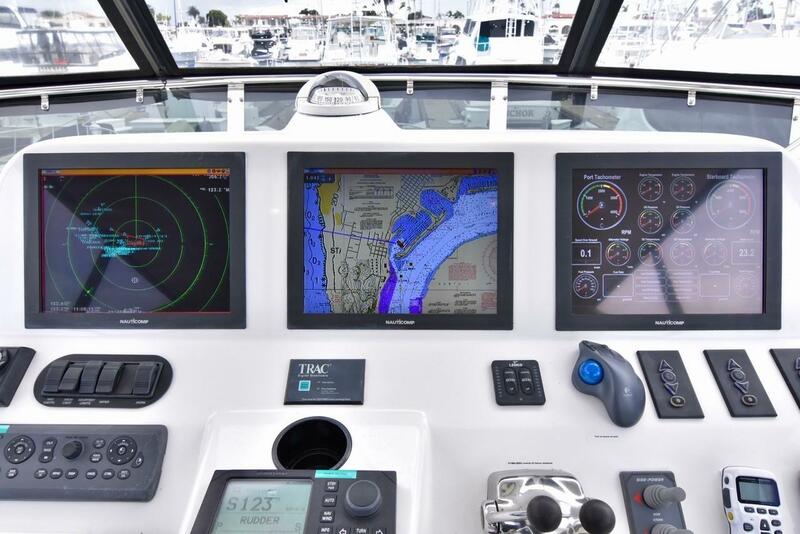 Escape hatches: (2) with screens and nightshades. Xenon lights with Vimar switching, xenon reading lights with switch at fixture. 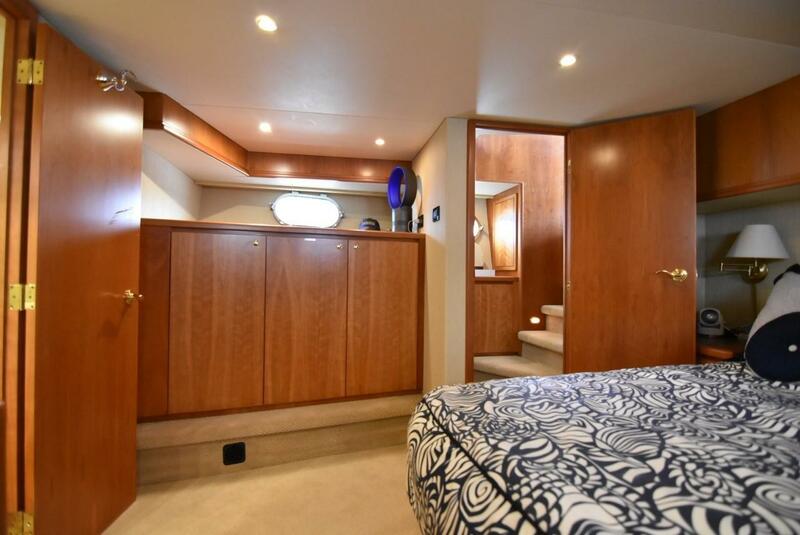 Built-in dressers, port and starboard (hull sides). 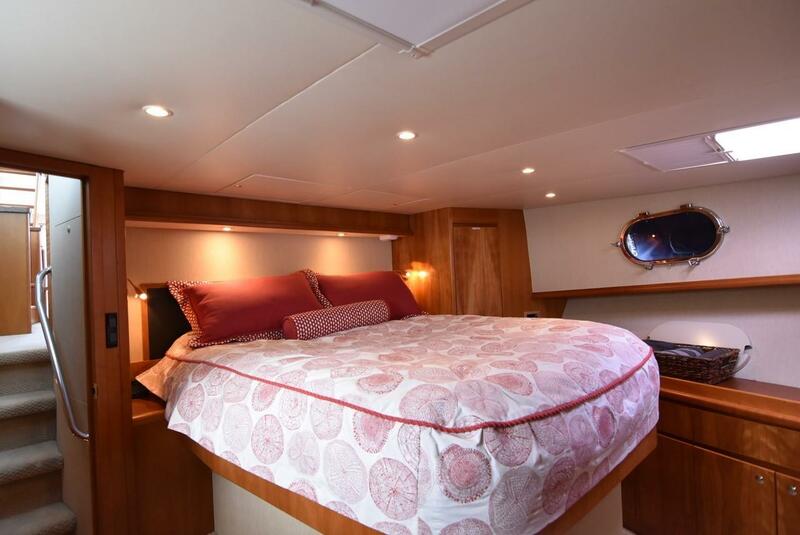 Queen-size bed with wood keeper, 5" foam mattress, bedspread and pillow shams (2). Forward Guest Head Solid surface countertop with oval sink, undermounted, with faucet (Grohe). Owners manual with schematic drawings for all systems. 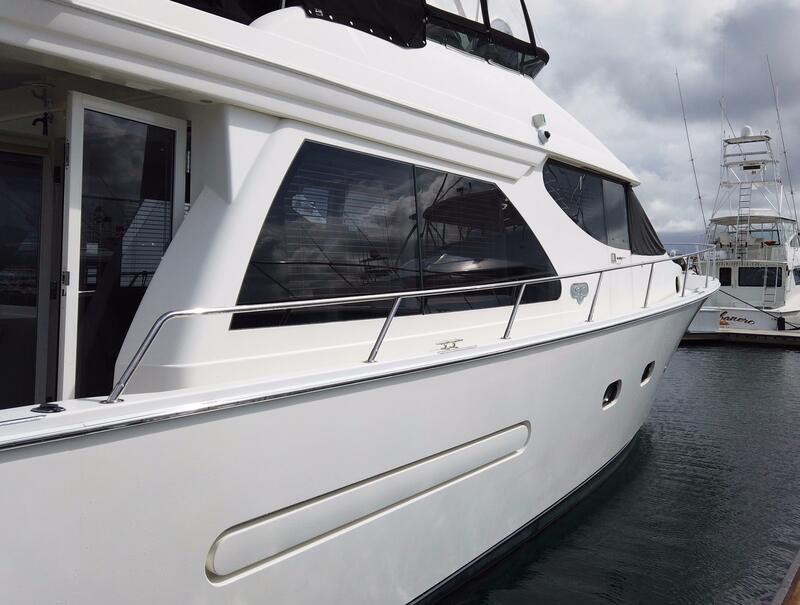 Osmosis protection below the waterline AOC vinyl ester resin. Camera System with 4 cameras.